People packed the first day of the 28th annual Fremont Festival of the Arts on Saturday, which is expected to draw close to 400,000 people over the weekend. The event claims to be the largest free street fair west of the Mississippi, and includes more than 600 artist booths, 34 food vendors, two music stages and numerous children’s activities at the YMCA Kid City. It covers four miles of central Fremont, largely along Paseo Padre Parkway and Capitol Avenue. Pulling her two nieces in a red wagon, San Diego resident Dianne Dorris said she’s been attending the event for the last six years. Vendors sold handmade items such as fine art, dresses, jewelry, soap, puppets and potpourri. Artists included Jan and Jim Knudson, whose photos of individual letters largely made up of items such as rotary telephones, golf clubs, wine bottles and fruit drew a steady stream of curious shoppers. Jan, a retiree who formerly ran a clothing wholesaler with her husband, said she got the idea for the business, dubbed “Letterosis,” more than three years ago after receiving a box of photos her sister took along the California coast. “We love being here. … We look forward to this festival, it’s the biggest one in the Bay Area we do and we love it and enjoy all the people,” she said. San Jose muralist Francisco Franco offered Day of the Dead-inspired artwork that included a portrait of Marilyn Monroe wearing ghostly skeletal makeup. Franco said he was also inspired by the life of artist Frida Kahlo and his own Chicano identity. Booths were manned by chiropractic and dental offices, financial advisers and gourmet food companies, including Crazy Charley BBQ sauce, Primo’s Gourmet Food and the Monterey Chocolate Company. Local service clubs were also in attendance, including Cub Scout troops, churches and sports organizations raising money through food sales. Beer, wine and margaritas were also available to purchase. A wine garden offered tastings, catered food and entertainment for $50. As the event began, singer-songwriter Liz Kennedy was the first to perform at the main stage on Paseo Padre Parkway to an audience of about 25 people who sat at tables under the shade of umbrellas. The music continued on the main stage into the early afternoon with Danny Click and his band, and Contino, a Zydeco and blues group. 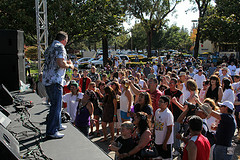 San Francisco’s Ultimate Tribute to Journey, a Journey tribute group, headlined the main stage at 4 PM. The Fremont festival, organized by the Fremont Chamber of Commerce, will continue Sunday from 10 a.m. to 6 p.m. The headliner will be Santana tribute band Caravanserai, which will perform from 4 to 5:30 PM.